During my sabbatical I knew I wanted to make health and fitness my #1 priority. This was important to me as it's something that I've always said I wanted to do, but have never truly prioritized. My career has always been my #1 priority. And I get incredibly obsessed with just that, leaving little room for other such important priorities. This time was going to be different as I had very proactively put my career on hold temporarily in an effort to create some real space for me to focus on health and fitness. So as I set out to execute on this, I knew I wanted to lose some weight as well as develop a habit of regular exercise that I could maintain for life. The question quickly became well how much weight should I lose? And how much exercise should I try to incorporate? And how was I going to measure my progress in terms of actual results? While there are easily accessible generally accepted health guidelines for both, I decided I'd take it a step further as I was really looking to use this time off to establish health and fitness best practices for life. I also knew that I was now past my prime now in my 30s so the dream of those washboard abs was long gone and instead was now looking to ensure I live a long healthy life. 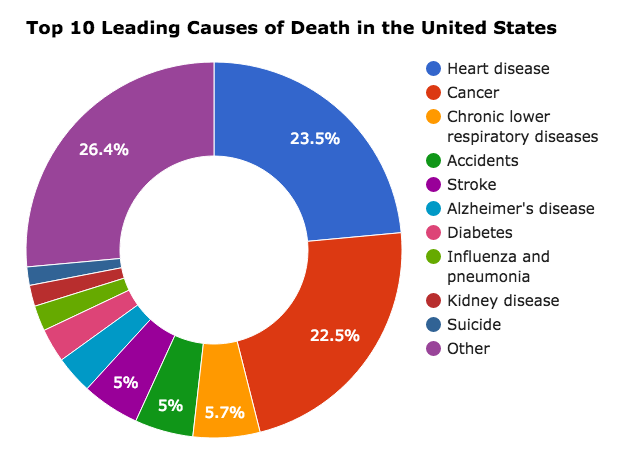 So I decided to analyze the top ten leading causes of death in the United States in an effort to help me produce a set of Health KPIs that I could use as life guidelines to reach not only my physique, energy, and endurance goals, but also to reduce the risk factors where possible for each of the leading causes of death. The Center for Disease Control (CDC) puts together a report each year on all the registered deaths in the United States. The most recent data comes from 2013, which saw a total of 2.6M Americans pass away, with an average life expectancy of 78.8 years. The top ten leading causes of death cover 74% of all deaths in the nation, with the top three alone accounting for 52%. 1. Heart disease: Lowering blood pressure and cholesterol can significantly lower heart disease risk as well as regular exercise. Avoid excessive alcohol use. Quit smoking. 2. Cancer: Lung cancer is the leading cancer. Quit smoking would solve a significant portion of these smoking-related cancers. Avoid excessive alcohol use. For skin cancer, avoid excessive direct sun exposure and wear sunscreen. More generally, many cases of cancer can be linked to being overweight, obese, or inactive. 3. Chronic lower respiratory diseases: Largely caused by smoking, so quit smoking. Also avoid air pollutants at home and in the workplace. 4. Accidents: Accidents are not only a top killer, but in fact the #1 leading cause of death for Americans under 44. Auto related accidents are the top category. Nearly 1/3 of traffic-related deaths are caused by being alcohol-impaired. Avoid driving while intoxicated. 5. Stroke: High blood pressure, high cholesterol, and smoking are major risk factors for stroke. Limit alcohol. 6. Alzheimer's disease: While the exact cause of Alzheimer's disease remains unknown, it has been linked to cardiovascular disease. Therefore reducing cardiovascular disease risk factors are helpful, including lowering blood pressure and cholesterol, exercising regularly, avoiding excessive alcohol usage, and quitting smoking. 7. Diabetes: Type 2 diabetes risk can be reduced by avoiding obesity and getting regular exercise. 8. Influenza and pneumonia: Get a flu shot every year to fight off seasonal influenza. Do not smoke. Avoid obesity and get regular exercise to better fend off all viruses. 9. Kidney diseases: Limit alcohol, quit smoking, avoid obesity. 10. Suicide: Avoid depression and substance abuse. A person's Body Mass Index (BMI) is their weight (in kilograms) divided by the square of their height in meters (easily calculated through many online BMI calculators). While it does not directly measure body fat, research has shown that it's correlated with more direct measures of body fat typically taken with skinfold measurements, bioelectrical impedence, underwater weighting, etc. Furthermore, it's been directly correlated with metabolic and disease outcomes that result from high body fat. So it's a simple and regular way to measure and keep track of your body fat simply by measuring your height and weight. More than 69% of adult Americans are currently overweight or obese and 35% of adult Americans are obese, putting them at significant risk for many of the top killers in America. To achieve a healthy BMI, it's important to devote to losing the appropriate amount of weight necessary to get there. Being physically active is a key risk reducer for a variety of the top ten leading causes of death. The question is, how much exercise do you need? The Physical Activity Guidelines for Americans (PAG), last updated in 2008, suggest that you should get 150 minutes of moderate-intensity aerobic physical activity or 75 minutes of vigorous-intensity aerobic physical activity per week for greatest health benefits. Aerobic activity should be performed in episodes of at least 10 minutes, and preferably, it should be spread throughout the week. These guidelines were modified from previous recommendations to make it easier for people to achieve by not demanding a consistent 30-min block each day, but allowing you to spread it out in different available time slots throughout the week (say 20 mins one day, an hour another day), as it was shown to provide the same benefits as the previous stricter 30 mins, 5 days a week guidelines. Moderate-intensive physical activity includes brisk walking, slow biking, yoga, golf, doubles tennis, etc. Vigorous-intensive physical activity includes running, swimming, fast biking, competitive sports, singles tennis, etc. Nearly 80% of adult Americans do not reach the recommended level of physical activity each week, putting them at risk for many of the top American killers. Take gradual steps towards increasing your physical activity until you reach these guidelines, remembering that some exercise is always better than none. Excessive alcohol consumption is also a key risk factor for several of the leading causes of death. It's thus important to ensure that you limit your consumption to moderate alcohol consumption per day, as defined by the Dietary Guidelines for Americans, which is 1 serving for women per day and 2 services for men per day. A drink serving is defined as 12 ounces of beer, 5 ounces of wine, or 1.5 ounces of liquor. More than 29% of adult Americans exceed the moderate alcohol consumption guidelines, putting them at risk for several of the top American killers. Cholesterol is a waxy substance that travels through your blood to various cells, produced primarily by your liver. As discussed above, high cholesterol has been shown to be a major risk factor in a variety of the leading causes of death. Cholesterol levels are measured by measuring the levels of lipoproteins, LDL and HDL, that carry cholesterol throughout the body. To get your cholesterol measured, request a lipoprotein panel blood test from your doctor. More than 32% of adult Americans currently have high LDL levels, putting them at risk for heart disease, stroke, and more. Reducing cholesterol is typically achieved through increasing your physical activity, reducing your weight, improving your diet, and prescription drugs. Blood pressure is the force of the blood pushing against the walls of the arteries. Each time the heart beats (about 60-70 times a minute at rest), it pumps out blood into the arteries. Your blood pressure is at its highest when the heart beats, pumping the blood. This is called systolic pressure. When the heart is at rest, between beats, your blood pressure falls. This is the diastolic pressure. Blood pressure is measured by these two numbers, the systolic and diastolic pressures, written one above the other, such as 120/80 mmHg. It's easily tested at your doctor's office with a simple blood pressure monitor. An ideal blood pressure is < 120/80 mmHg. More than 29% of adult Americans have high blood pressure, putting them at risk for heart disease, stroke, and more. Reducing blood pressure is typically achieved through reducing your weight, increasing physical activity, reducing alcohol consumption, reducing sodium, as well as other potential diet changes. While type 2 diabetes risk factors are largely reduced through achieving the other measures shown here (BMI, exercise guidelines), if you have a history of diabetes in your family, it may make sense to independently test for the risk through periodic fasting blood sugar tests. You simply fast for 8 hours and then get your blood drawn. More than 35% of adult Americans have pre-diabetes, putting them at significant risk for developing type 2 diabetes, heart disease, and stroke. Reducing fasting blood sugar is typically achieved through reducing your weight, increasing physical activity, and improving your diet (noticing a pattern yet?). 1. Quit smoking: As the primary cause of lung cancer as well as chronic lower respiratory diseases, you should quit smoking if you still do it as it continues to be a significant killer in America. 2. Don't drive while intoxicated: Don't drink and drive, as it continues to be the single biggest cause of traffic accidents. And wear your seatbelt. 3. Get a flu shot every year: Reduce your own chances of getting the flu as well as help at-risk audiences like the elderly and children prevent its spread. While most of these recommendations weren't new to me, it was helpful to develop a single health scorecard that I can now use to track how I'm doing against achieving my lifelong health goals. Do you have other Health KPIs that you are using to track your own performance? Would love to hear from you in the comments!